Great service, nice hotel. Very modern and clean. Great location. They could have had at least coffee in the early morning? Where to find Richmond hotels near an airport? How can I find hotels in different Richmond neighborhoods? Where can I find hotels in Richmond that are near tourist attractions? There are plenty of options for those who are looking for a suitable hotel in or near Richmond. Expedia's comprehensive database has 48 places to base yourself within a 0.1-kilometre (0.06-mile) distance of Richmond's center. Richmond offers travelers a number of convenient accommodations, including the Richmond Marriott and The Berkeley Hotel. Glen Allen is a popular accommodation area. Glen Allen is 15 kilometres (9 miles) from downtown, and has 21 Expedia hotels. Accommodation options here include the Richmond Marriott Short Pump and Courtyard by Marriott Richmond North. Alternatively, you could find a place to stay in Chester, which is the neighborhood where you'll find the Residence Inn Marriott Chester and Courtyard by Marriott Richmond Chester, and Ashland, which has the Holiday Inn Express Hotel & Suites Richmond North Ashland and Country Inn And Suites Hanover. The Courtyard by Marriott Richmond Airport and Richmond Airport Hotel are located in Sandston, while Hampton Inn Petersburg-Southpark Mall and Holiday Inn Petersburg North - Ft. Lee are part of the Colonial Heights area. 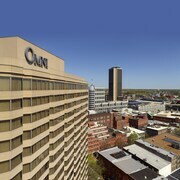 The Clarion Hotel Central is near Virginia Museum of Fine Arts. Another close Expedia-listed hotel is the Diamond Inn and Suites. If you'd prefer to stay near Science Museum of Virginia, you could try the Crowne Plaza Richmond Downtown or the Holiday Inn Express Richmond Downtown. The Museum of the Confederacy and the Lewis Ginter Botanical Garden are two other well-known Richmond attractions. 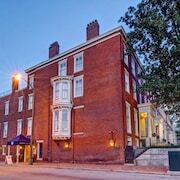 The Omni Richmond Hotel and the Linden Row Inn are within walking distance from the Museum of the Confederacy. While the Best Western Plus Glen Allen Inn and the Sleep Inn Richmond, are near the Lewis Ginter Botanical Garden. At Expedia, we appreciate that all travelers possess varying vacation budgets. If you're looking for somewhere to base yourself that is at the more affordable end of the range, Richmond has some nice options. 11 kilometres (7 miles) away from Richmond's downtown area you'll find the Best Western Plus Glen Allen Inn. The La Quinta Inn Richmond South is just 16 kilometres (10 miles) away. The Extended Stay America - Richmond - Innsbrook and the Quality Inn At Fort Lee are two more economical hotels worth looking into. 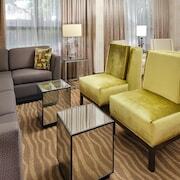 Check out the The Westin Richmond as well as the The Hilton Richmond Hotel & Spa / Short Pump. The The Westin Richmond can be found 10 kilometres (6 miles) away from the center of Richmond. The The Hilton Richmond Hotel & Spa / Short Pump, is 20 kilometres (13 miles) away. Two more hotel options include the Embassy Suites Richmond - The Commerce Center and the HYATT house Richmond-West. After you have enjoyed Richmond, schedule in a little time visit the other cultural and scenic attractions of the Central Virginia area. Check out Central Virginia's history museums. Outdoorsy types could also take the time to check out the region's rolling hills. Popular things to do in this part of United States of America include hiking and horse riding. Looking for more things to do? Why not spend the day exploring Drewry's Bluff and Art Works Studios & Galleries, which you'll find in Southside, 10 kilometres (6 miles) to the southwest of Richmond. If you'd like to spend a night or two in Southside, be sure to check out the Days Inn Richmond/South and Americas Best Value Inn. 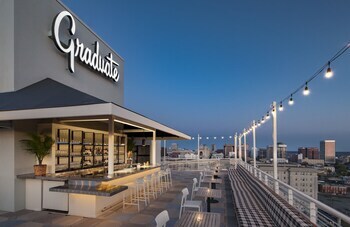 Or, you could stay in Downtown Richmond, 0.4 kilometres (0.2 miles) to the southeast of Richmond, where you can pick from the HI Richmond - Hostel and Quirk Hotel. Regardless of whether you're passing through or spending a few nights in Downtown Richmond, set aside some time to visit the Virginia War Memorial and Virginia Governor's Mansion. If you are traveling into or out of Richmond International Airport and are looking to stay nearby try Hyatt Place Richmond Airport or Hilton Garden Inn Richmond Airport. What are the most popular Richmond hotels? Are there hotels in other cities near Richmond? 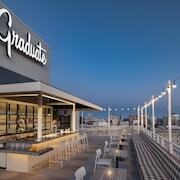 What other types of accommodations are available in Richmond? Explore Richmond with Expedia.ca’s Travel Guides to find the best flights, cars, holiday packages and more!